Before you process to Magento 1.9 & 1.8 upgrade any upgrade, please take due backup of all your source files and database. You can read the detailed upgrade guide from Magento Knowledge Base or follow 7 steps as below. 1. In advance of any upgrade, you have to clear cache first. In your Admin Panel, navigate through System >> Cache Management. In the Cache Storage Management section, select all the cache types, and Submit to disable cache. 2. 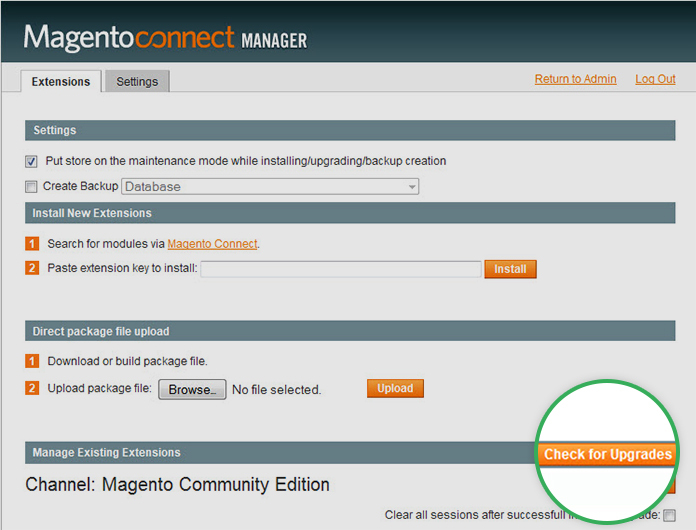 Navigate to System >> Magento Connect Manager. 3. Log in with your Magento admin account. 4. In Extensions tab, click to Check for Upgrades. You may have to wait a while for the process. 5. The out-dated extensions or components are highlighted. Choose the latest version of each item. No highlighted item should be missed out. 6. Click to Commit Changes. 7. Wait for the process to complete. Click Refesh and now it’s all set. Now go back to your Admin Panel for further upgrade and configuration. There are 2 ways to upgrade your site to Magento 1.8 or 1.9. Choose the method that suits you best. Due to changes in folder structure of Magento 1.8 or 1.9 in comparison with Magento 1.7, the best way is to do manual upgrade and customization. Follow our Manual Upgrade Guide as below for details. Simply download our themes with the updated versions for Magento 1.8 or 1.9 and install to your site. No manual upgrade is required. Open your site root folder. Here come codes for specific files to replace for the Magento updated versions. If you can not find any named file as following, leave it and continue editing the others.